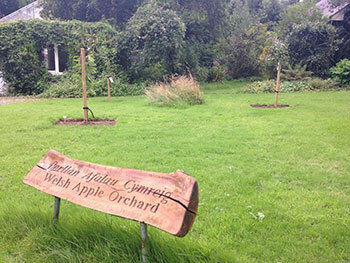 We have recently planted a Welsh Heritage Fruit orchard, to teach and inspire the general public about native fruit trees in Wales. These include Denbigh Plum, Bardsey Apple and Cariad Cherry. These are rare and special varieties that have a long interesting history in Wales. Especially the Bardsey apple that if found nowhere else in the world. This variety of apple is believed to date back to the 13th Century when it was grown by monks. An old Victorian cooking apple, going back to at least the 1870's. Named after its unusual shape, rather than its flavour. This is a very early cooking apple. Can be picked in August, the fruit will last until October. Bright green and then turning gold. The crop can be extremely heavy, even on very young trees. The fruit are very large. Excellent for dried apple rings (White and tangy). Cooks to a brisk, light purée. .
Raised by John Basham & Sons of Bassaleg in Monmouthshire in 1900 from a seedling of Cox's Orange Pippin. This juicy apple was a popular variety and has an intense aromatic flavour. The flavour is said to be at its most exquisite on St Cecilia's Day (Nov 22nd). St Cecilia is the patron saint of music. St Cecilia is a vigorous and heavy cropping tree. Pick in October and use December to March. A large green cooking apple, long grown on Anglesey. First recorded in the 1600's. It is named because of its unique shape. It cooks to a robustly flavoured, slightly perfumed puree. Needing a little additional sugar. Wrapped in pastry and then baked, it was often eaten as dumplings in the field by agricultural labourers. The fruit keeps for several months in cool storage. The flavour mellows with time to an excellent brisk eating apple, ideal for enlivening salads. Crops Heavily. Nant Gwrtheryn on the Pen Llyn in North Wales was an isolated quarry community accessible only by the sea. A delightful golden russet eating apple with a fascinating fennel flavour was found four years ago in the remains of the quarry manager's garden. Although over 100 years old, the battered old tree still produces sound fruit. The once derelict buildings of Nant Gwrtheryn are now restored and are used as a Welsh language and Heritage centre. The walk down to the village and the sea views are fabulous. Be sure to visit the museum and cafe. This naturally disease resistant apple is ideal for organic cultivation in Wales. Pick in October, use October to December. Dates back to the C18th,very popular with South Wales coal miners as the tangy yet sweet juice was particularly refreshing down the pits. Pick and eat in September. It has been used over the years as a popular cider variety making a robust yet sweet early cider, ready for Xmas. Bred by Ian Sturrock and Sons for Mr C.Golan of Plas Ty Coch, Caernafon. The object was to produce a cherry that would do well in the Welsh Climate, i.e. would be: Self-fertile, not prone to cracking in wet years, not suffer from bacterial cancker and ripen well in a relatively gloomy spring. Stella was crossed with Napaleon Bigarreau, which was then crossed with a Devon Mazzard. The trees have been tested along the banks of the Menai Straights for the past ten years. Medium sized, sweet, red skinned cherry. Pinked fleshed and very juicy. Picking time (In North Wales) is in early August. First mentioned in 1785. Exactly where in Denbigh remains uncertain. It is the only native Welsh plum to survive. It has large dark-red fruit that are strewn with golden dots. The flesh is sweet and juicy with a good depth of flavour.